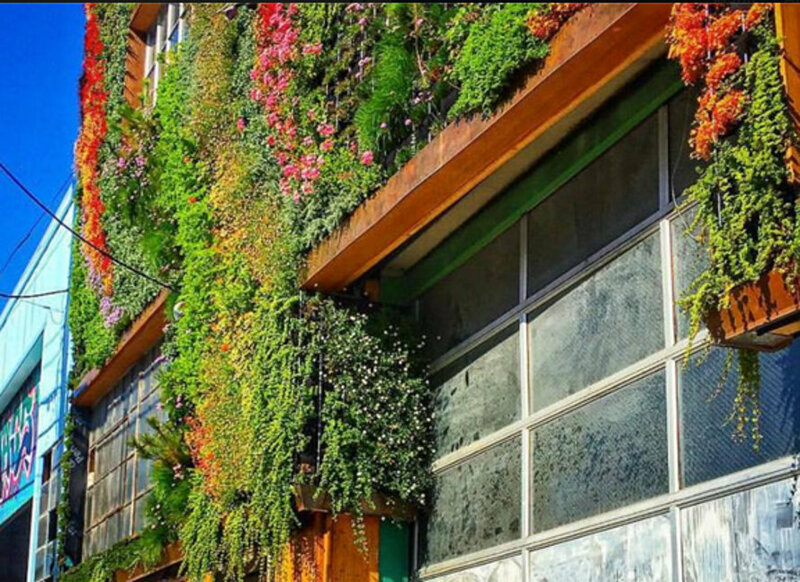 In San Francisco, greenery has taken over the facade of the SafeHouse - former headquarters of Cafe Gratitude - but it’s not because the building is abandoned. 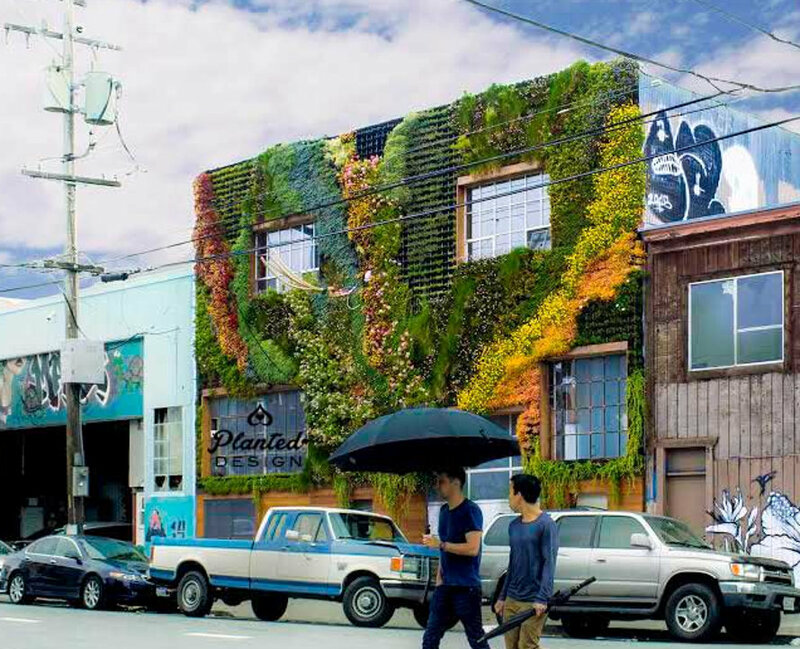 Designer and building manager Zach Heineman hired botanical artist Amanda Goldberg and Brandon Pruett to collaborate on the living mural that now adorns the front of the building, located on 14th Street between Folsom and South Van Ness in the heart of the Mission District. Amid the colorful painted murals common to the neighborhood, the green masterpiece has grown to become a cherished neighborhood landmark. We’re talking about an enormous wall of plants in California, where a severe drought has robbed residents of much-needed water for several years. 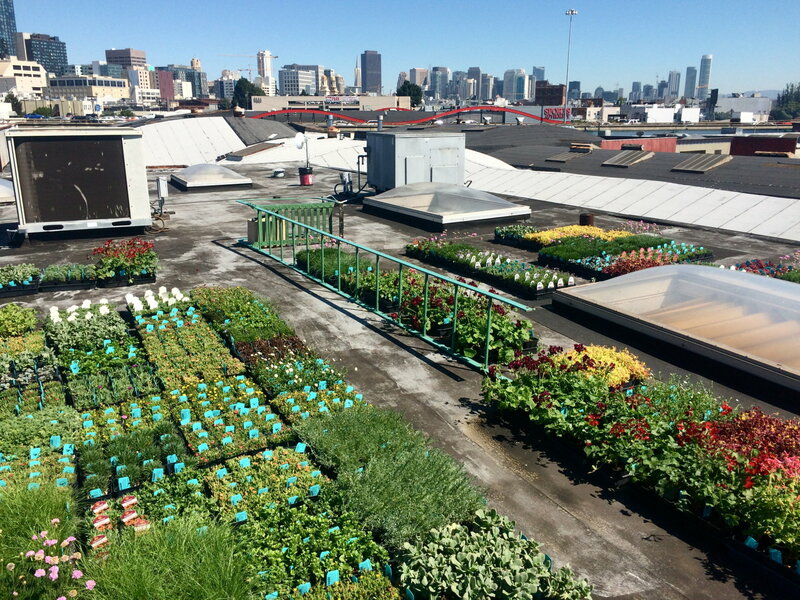 With that in mind, Heineman, Pruett, and Brett Stephens of SF Landscapes, and Goldberg along with her team at Planted Design created the 1,200-square-foot living mural from 3,200 drought-tolerant plants. The mural also includes an ingenious irrigation system, design by SF Landscapes, that collects and recycles rainwater using copper gutters and a 1,350-gallon recirculating rainwater collection tank. Some 200 feet of drip irrigation help keep the plants watered in the midst of a California water shortage. In addition to being a sustainable masterpiece of ecological engineering, the greenery decorating the SafeHouse is also quite a sight to behold. The mural was carefully planned on a grid, much like a cross-stitch pattern, with undulating channels of varied colors leading from the sidewalk to the sky. The lush living wall has also created much-needed habitat for wildlife where none existed before, inviting birds, bees, and other critters to take up residency in the greenery, and a rooftop garden extends the greenery upward. The project interacts with the sense of smell, also. Yerba Buena, a native mint plant with little white flowers, was strategically placed over the doorway. The plant emits the aroma of mint, giving a little uplifting aromatherapy to those who enter the building. The living wall also features fescue, pine, oxalis, tansy, geraniums, and many others. @laff60 - I will dig up an extensive plant list later, but there is fescue, geraniums, oxalis, yerba buena, tansy, and even pine growing on this wall! @albert cali - you're right, the original location wasn't quite correct - I updated it. The story lists the building as being "located between 14th Street and Van Ness." People are never going to find it with that misleading information. It is located at 160 14th Street, between South Van Ness and Folsom. We’re talking about an enormous wall of plants in California, where a severe drought has robbed residents of much-needed water for several years. With that in mind, Heineman, SF Landscapes, Goldberg and her team at Planted Design created the 1,200-square-foot living mural from 3,200 drought-tolerant plants. The mural also includes an ingenious irrigation system, fed by a 1,350-gallon recirculating rainwater collection tank, design by SF Landscapes. Copper gutters and 200 feet of irrigation help keep the plants happy in the midst of a water shortage. In addition to being a sustainable masterpiece of ecological engineering, the greenery decorating the Be Safe House is also quite a sight to behold. The mural was carefully planned on a grid, much like a cross-stitch pattern, with undulating channels of varied colors leading from the sidewalk to the sky. The lush living wall has also created much-needed habitat for wildlife where none existed before, inviting birds, bees, and other critters to take up residency in the greenery, and a rooftop garden extends the greenery upward. The project interacts with the sense of smell, also. Yerba Buena, a native trailing plant with little white flowers, was strategically placed over the doorway. The plant emits the aroma of mint, giving a little uplifting aromatherapy to those who enter the building.